I stumbled across this movie, purely by accident, on a local digital broadcast movie channel. There is a remarkable amount of steam train footage, particularly during the finale, in this musical family picture. I immediately Amazoned the DVD. Filmed on the New York, New Haven & Hartford Railroad, mostly in Connecticut, coal-burner New Haven 2-8-2 # 3016 Class J-1 was pulled from the storage line to join a heavyweight coach, boxcar and caboose to masquerade as “Old 97”, the local freight/passenger train. Old 97 belches smoke as it rolls into Cape Anne, Maine. Doris Day stars as “Jane”, the single mom raising two kids with her lobster business in Cape Anne, Maine. Jane’s big lobster shipment and reputation is ruined by careless railroad handling on the fictitious Eastern & Portland (E&P) Railroad. Determined to fight back, she enlists the help of her former childhood friend, “George Denham”, now a lawyer and played by Jack Lemmon. Together, they take on the “World’s Meanest Man” (Harry Foster Malone), played with gleeful malice by Ernie Kovacks as President and Chief Stockholder of the E & P Railroad. President Malone feasting on (ironically) lobster. Note the O Scale models of E&P diesels and steam locomotive in the background. Jane becomes a minor celebrity with the media in her battle against Malone’s dirty tricks. Finally she decides to take the next lobster load herself to market on “her train”, the old 97. After the townfolk pitch in to load up the tender, the train sets off with Lemmon as fireman, shoveling coal for all he’s worth, and getting dirtier and dirtier. The townsfolk of Cape Anne scrounge up all the local coal and collectively fill the engine’s tender. Later, they give Old 97 a big send off with its load of lobster. There are some terrific shots of old 97 running through the countryside whistling away, until it runs out of coal…right across a diamond blocking all train traffic. There are some great shots of NH EMD FL9’s in the background leading trains stopped by old 97. Old 97 blocks two mainlines at a junction after running out of coal. A New Haven FL9 (with E&P nose logo) prepares to shove Old 97 off the diamonds. Will Jane get her crustaceans to market on time? Will Malone foil her plans with his nefarious deeds? Stream, rent or buy this video and find out! 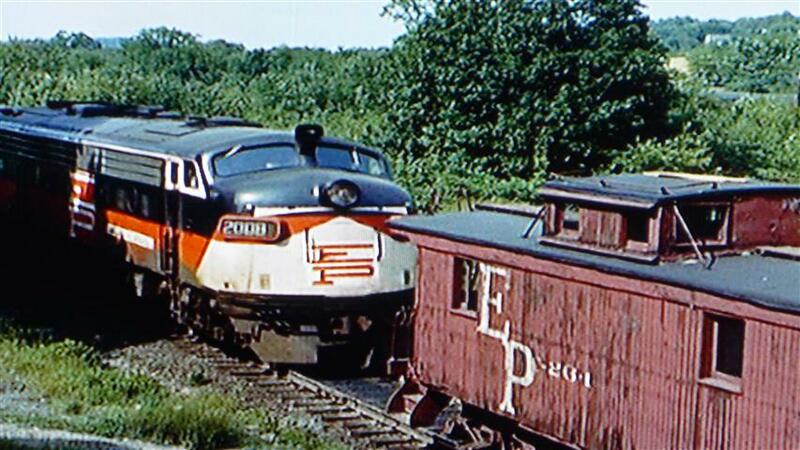 This entry was posted in Uncategorized and tagged Doris Day, E&P Railroad, Eastern & Portland Railroad, Ernie Kovacks, It Happened To Jane, Jack Lemmon, New Haven Railroad, New York New Haven and Hartford Railroad, Old 97. Bookmark the permalink. I remember seeing this a few years ago — it wasn’t terrible. I forgot how much it had to do with trains! The NEW HAVEN pulled out a special train just for the premier promotion!!!! The movie made me laugh!!! I want to redo an Athearn F7 in New Haven paint into Eastern and Portland paint to see if anyone will notice at a train show!!! Willie, A model F unit in E&P would be a hoot. Note in photo at table,but barely visible behind the waiter’s head,is an electric EP-5 “jet” in E&P colors. In the photo above of “old 97” blocking jct, this is Plainfield Jct CT. Other scenes on Colchester branch. Where did the time go? Paid .35 cents to see this in 1959.